Back in the 1990s, in Southern California, movies were preceded not only by trailers for future films but ads for the Los Angeles Times. I think there must have been some exchange agreement with the papers and the theaters, as an advertising tradeoff. Since the internet took off as the main source of info about show times and theater locations, the ad revenue dropped and the newspaper stopped being advertised in front of every movie playing in So Cal. In the ten years before they disappeared, the paper promoted it's unique position as the Company Town paper by making the ads focus on the movie business. Many of the ads had nice bits of info about movie making and some of the personalities involved. In celebration of the past, as a service to any of my readers from other parts of the world or from more recent times, I am including these snippets in my reviews for the rest of the year. In honor of today's film, you got the LA Times movie ad featuring some special effects using guns, and bows and arrows. This is especially appropriate given the nature of today's movie. The Red Band Trailer that you see above, was the deciding point for me in seeing this film. Prior to this trailer, the movie looked like some CGI action flick that had a weird subject and a silly point of view. Once I saw the trailer, I did not really change my mind but I did add on to my expectation, violent blood splatter and reckless disembowelment. Once I knew that was coming I was on board. Sunday mornings decapitating witches and eviscerating them as they fly through the forest, yeah, that's more like my cup of tea. In all truth, it is not as gruesome as it might have been, and the CGI takes the edge off a lot of the gore, but for a stupid idea with a stupid script it pretty much lived up to my low hopes. The idea of taking a fairy tale and turning it into the basis of an action film is not new. Heck, last year we had "Snow White and the Huntsman" and twenty five years ago there was "The Company of Wolves". The difference here is that it is all being played for laughs. Nothing is supposed to be serious, from the narration to the weaponry of the leads, to the obvious tip off of a 3D promotional tag. The very opening of the film takes a shot at a long gone cultural reference, pictures of missing children on a milk carton. Of course they are bottles of milk, the pictures are drawings and they are tied onto each individual bottle. If the script could have kept up with that tone a little more, this movie would work a lot better and be more fun. As it is, not too long after it gets started, it begins to take itself too seriously. Sometimes that is the story, which involves white witches and black witches in a struggle for dominance. Sometimes it is the characters who are not given enough to say and are reacting more than attacking. 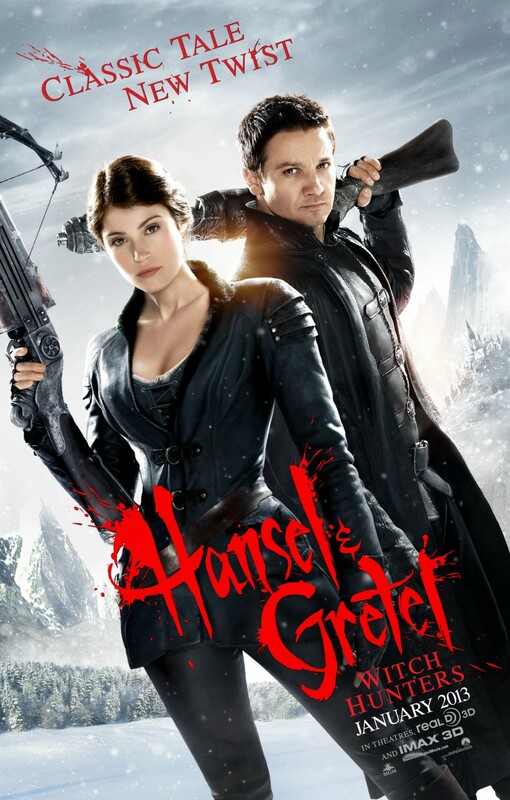 This movie needs a big shot of Bruce Campbell to make it work, instead we get Jeremy Renner. Renner is a real actor, slumming in a piece of schlock, probably for a change of pace and a nice paycheck. An while he is amusing, he simply does not have the comic persona a piece of silliness like this needs. By all means go and see this if you have a screening in 3D and money burning a hole in your pocket. It won't hurt you or insult you, but it won't make your juices flow much either. There is potential for great pulp stupidity in this film, but it can't quite catch fire like all the witches need to do in the story. There are things about it that could work, but I don't have the energy or need to talk about them. This is just another filler until better stuff shows up, move along.